KÖNIG GALERIE presents “Buchtipp 2” - the third solo exhibition of Manuel Graf. 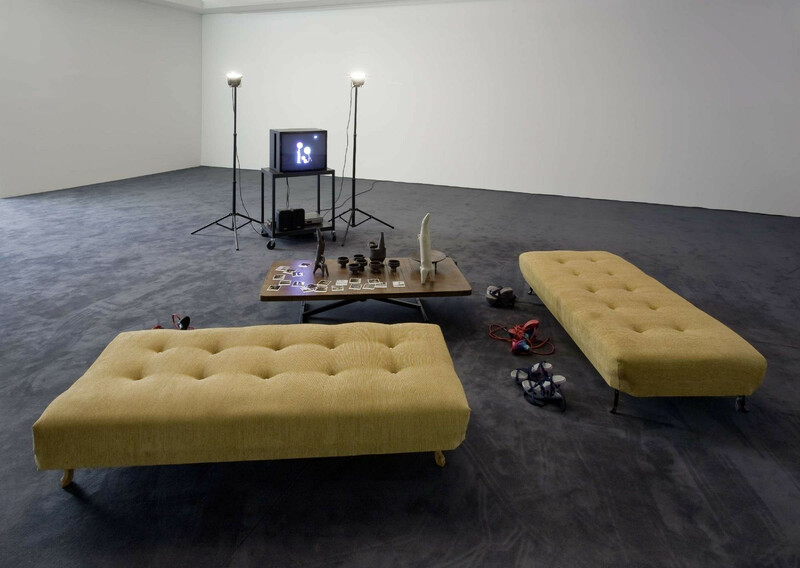 In the middle of the exhibition space are two sofas, as well as a coffee table arranged with a tea set. Before them lie a pair of high wedge-heel shoes with simply tied shoelaces, the owner of which can be seen in polaroid photographs during her stay at this place. All of these objects have been produced by Manuel Graf. A television set is playing in the background. The screen displays couples speaking about Rudolf Steiner's book “Kernpunkte der sozialen Frage”, in which different theses about the relation between man and work are discussed. An act carried out in the intimate atmosphere of collective reading and understanding, Manuel Graf invites the visitor to take a seat and watch the film. His work “Buchtipp 2” is an encouragement towards further reading. The title of the exhibition should, as in his earlier work “Buchtipp” (2009), be taken literally. In his works, consisting mostly of video and precisely arranged objects, Manuel Graf deals with the development of those forms connected to the basic needs of man. Through the process of producing the objects himself, it can be appreciated by how something new arises from a gradual forming and deforming. In this way, the simple connection between foot and sole by a shoelace is completed by a mix of traditional and modern references: Venetian stilt shoes and Ottoman boots meet Bernard Rudofsky designs. Works from Manuel Graf (*1978 in Bühl, Baden) were last shown in solo exhibitions at the Kunstverein Göttingen, at the Museum X Abteiberg Mönchengladbach (Rheingold Collection) and at the Galerie van Horn in Düsseldorf, amongst others. Furthermore, his works were also presented at the Kunstverein Nürnberg, the Museumsquartier in Vienna and the Julia Stoschek Collection in Düsseldorf. He is also the 2008/2009 recipient for ars viva.